The global CBD hemp oil market was valued at US$ 972.5 Mn in 2017. It is projected to expand at a compound annual growth rate (CAGR) of 11.9% from 2018 to 2026, according to a new report published by Transparency Market Research (TMR) titled “CBD Hemp Oil Market Global Industry Analysis, Size, Share, Growth, Trends, and Forecast, 2018–2026”. The report suggests that rising awareness regarding treatment procedures for depression and anxiety and high yield in cannabis production for medical usage is expected to boost the CBD hemp oil market in the near future. North America and Europe are projected to dominate the global market owing to increase in production of CBD hemp oil from cannabis & marijuana and the high rate of adoption of CBD hemp oil for treatment planning by doctors as well as patients. The market in Asia Pacific is projected to witness expansion at a significant growth rate during the forecast period. 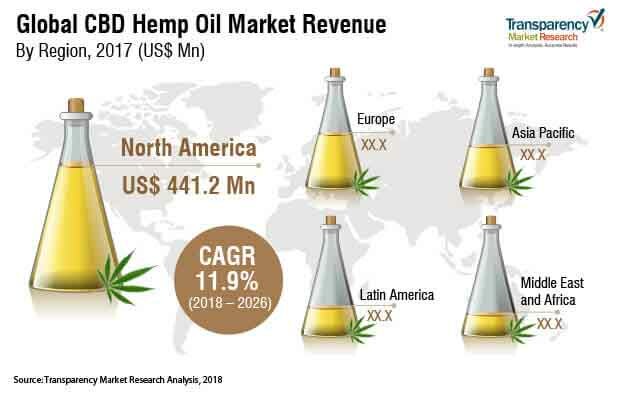 Expansion of the market in Asia Pacific is attributed to the large base of production of hemp or marijuana, rising geriatric population with chronic diseases, and increasing adoption of CBD hemp oil for neurological disorder therapy. The market for CBD hemp oil in Latin America is likely to expand at a moderate growth rate during the forecast period. The global CBD hemp oil market is projected to be potentially driven by the technological use of CBD hemp oil. Technological developments are being offered by various CBD hemp oil manufacturing companies in order to streamline the usage of CBD hemp oil in treating patients and increase revenues on sale of CBD hemp oil. CBD hemp oil manufacturing companies provide diverse features and benefits to patients, ranging from pain heeling remedies to sleep disorder treatment procedures, which can be utilized by physicians to treat patients. These features help physicians and nurses to streamline the chronic disease treatment activity required for patients in order to maintain their daily workflow efficiently and effectively. Key players offering the CBD hemp oil are developing technical features, such as effective capsules, vapes, tincture, and spray, which reduce the overall chances of increasing effect of diseases and thus, improves the overall effectiveness and efficiency of medical or surgery practices. Companies are focusing on the development of CBD hemp oil therapy by patient education & awareness programs. These technical uses of CBD hemp oil features save the operational time of physicians and help improve the performance of the healthcare provider. Hemp-based CBD hemp oil is commonly utilized in chronic disease and other neurological disorder treatment procedures. Hemp-based CBD oil produces a full spectrum of more than 80 different phyto-cannabinoids, which are helpful in treating different neurological disorders and other chronic diseases. Marijuana plants contain high levels of tetrahydrocannabinol (THC), while hemp contains very little of the psychoactive chemical. Hence, the demand for hemp-based CBD oil is more than the demand for marijuana-based CBD hemp oil. For instance, countries including Canada and U.S. set the maximum THC content of hemp oil at 0.3%, which is considered to be legal in North America. Hemp-based CBD oil enables the user to practice low frequency clinical applications, allow the healing of chronic infection, and assurance of 90% recovery features by physicians are likely to propel the hemp-based segment during the forecast period. Hemp-based CBD oil address specific challenges faced during the treatment procedures due to the presence of psychoactive cannabinoid, which can increase sensation of relief from pain and other symptoms without the mind-altering effects of marijuana or certain pharmaceutical drugs. Neurological pain treatment procedure is likely to utilize CBD hemp oil during the forecast period due to the oil’s properties. CBD hemp oil produces endocannabinoids, which are neurotransmitters that bind to cannabinoid receptors in the nervous system. This operative function of CBD hemp oil is likely to boost the neurological pain segment of the market during the forecast period. In terms of distribution channel, the hospital pharmacies segment accounted for a leading share of the global CBD hemp oil market. It is estimated to gain market share by the end of 2026, expanding at a CAGR more than 11% during the forecast period. Expansion of life sciences and pharmaceutical industries has led to the high market share held by the hospital pharmacies segment in the global CBD hemp oil market. Increasing number of multinational hospital chains with pharmacies is likely to drive the hospital pharmacies segment during the forecast period. High digitization of mobile application, better pricing, discounts, doorstep delivery within a short time, and validation of prescription through licensed pharmacists are a few factors that are likely to boost the online pharmacies segment between 2018 and 2026. North America and Europe accounted for a key share of the global CBD hemp oil market in 2017. These are likely to gain market share by the end of 2026. High adoption of digital platforms for online pharmacies, legalization cannabis production in several countries in Asia Pacific, and government initiatives to promote the usage of CBD hemp oil techniques have contributed to the leading share held by these regions in the global CBD hemp oil market. Asia Pacific is projected to be a highly attractive market for CBD hemp oil, and is likely to exhibit a considerably high attractiveness index during the forecast period. The market in Asia Pacific is projected to expand at a high CAGR of more than 12% during the forecast period due to rise in the number of hemp-based industries in emerging countries such as India and China. Furthermore, well-established healthcare facilities, and high adoption of digital healthcare technology in countries such as Japan, Australia & New Zealand, Malaysia, and Singapore are likely to fuel the market in Asia Pacific. The market in Latin America is anticipated to expand at a moderate growth rate during the forecast period. The report also provide profiles of leading players operating in the global CBD hemp oil market. ENDOCA, Medical Marijuana, Cannoid, Canopy Growth Corporation, and Elixinol Global Limited are some of the leading players operating in the global CBD hemp oil market and account for a significant market share. Companies operating in the CBD hemp oil industry are focusing on increasing their geographic presence by means of strategic acquisitions and collaborations with leading players in their respective domains and geographies. In January 2018, Profile Solutions, Inc. acquired Elite Products International, Inc. to distribute and manufacture cutting-edge cannabis, cannabinoid, and hemp extracts in the form of edibles, creams, oils, and salves for humans and pets. Other prominent players operating in the global CBD hemp oil include Isodiol, NuLeaf Naturals, PharmaHemp, Aphria Inc., and Folium Biosciences.